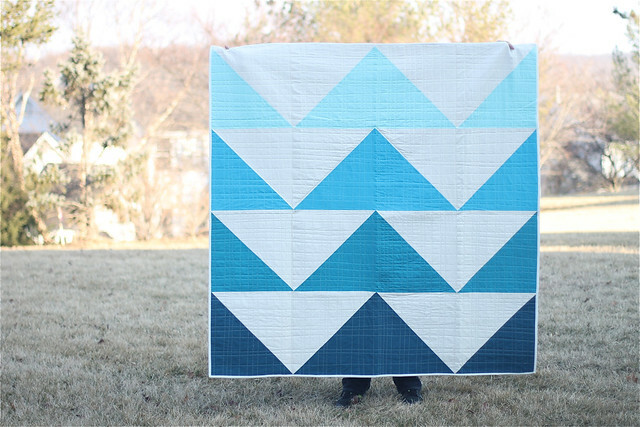 This is such a fun and fast quilt… I couldn’t not share the tutorial with ya’ll! It’s a great quilt for a beginner. 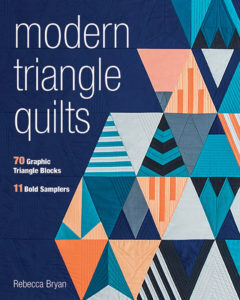 The quilt is made using Half Square Triangles (HSTs). Each Flying Geese block is comprised of 2 HSTs. Super easy! I made a throw size: 64” x 64”. But you could easily make a crib size, twin, or maybe a queen or King, I think. Here a table showing the possible quilt sizes, the number of HSTs and Flying Geese needed to make for each size, and the fabric requirements for each size. I made a throw sized gradient quilt; so I got 2 yards of white, 1/2 yard each of Kona Azure, Kona Lagoon, Kona Oasis, and Kona Celestial. 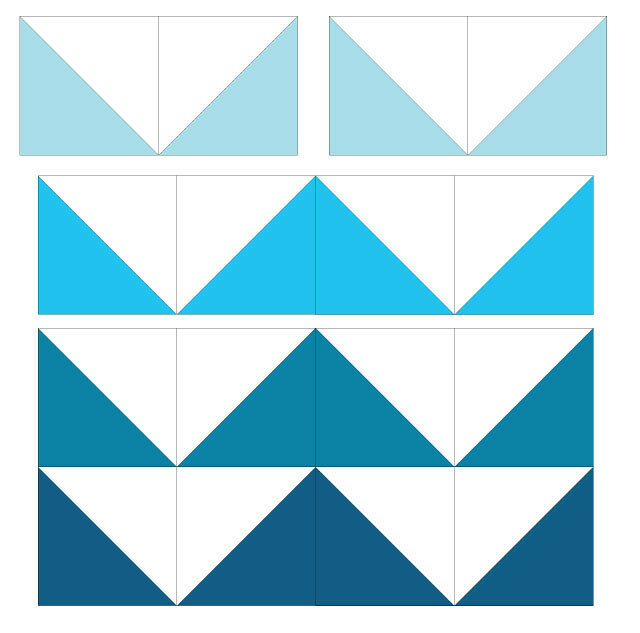 In the column on the very right I also provided yardage requirements should you want to make a two-color quilt; for example if you wanted to make a twin sized quilt using just white and blue, you would need to get 2 1/2 yards of white fabric and 2 1/2 yards of blue fabric. I hope that’s all clear. First I’ll walk you through the tutorial using the throw size as an example. Then I’ll show you the other sizes. 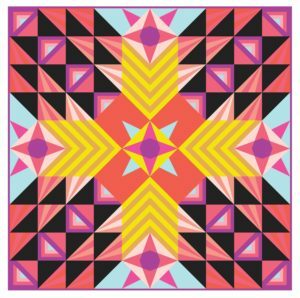 For each giant Flying Geese block cut one 17-inch square from the background fabric and the geese fabric. For my quilt, I had two Flying Geese block from each color, so I cut 2 squares from each of my 4 colors and 8 squares from the white fabric. 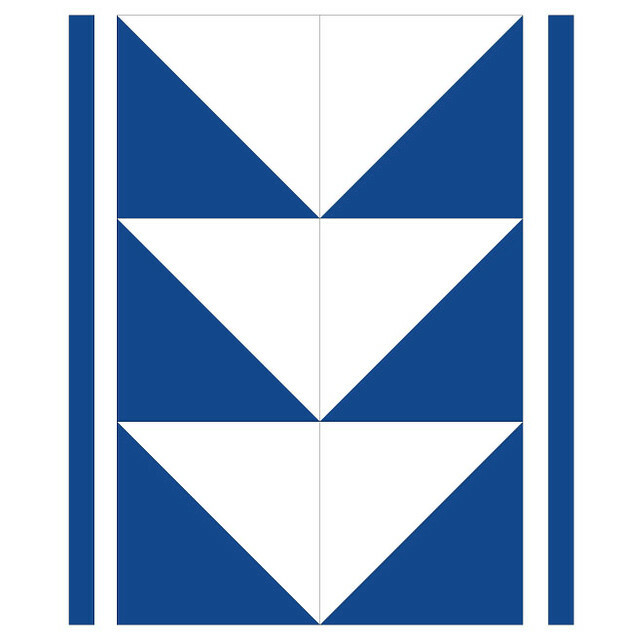 Now make your Half Square Triangles (HSTs). On the wrong side of each of the background squares, draw a diagonal line with a fabric-marking pen. Then pair the background and geese squares right sides together. Then sew along either side of the diagonal line using a 1/4” seam allowance. Then cut along the marked diagonal line. Press seams toward the darker fabric. 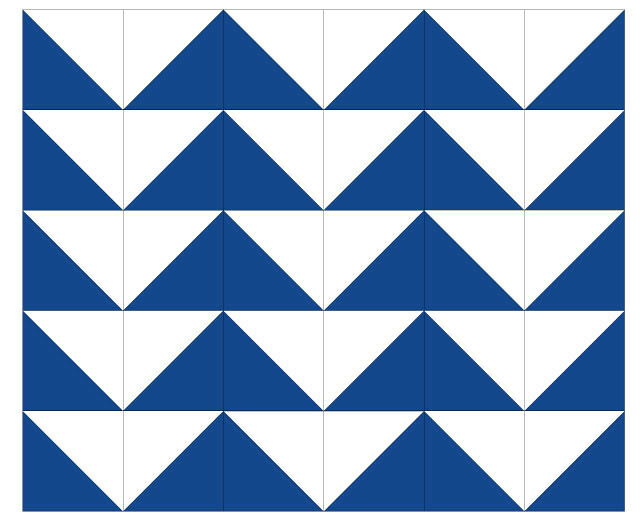 Each pair of squares will yield 2 HSTs. Trim the HSTs to 16 1/2”. For my throw quilt, I made 16 HSTs. 4 of each color. Sew the HSTs together to create the Flying Geese blocks. Press seams open. 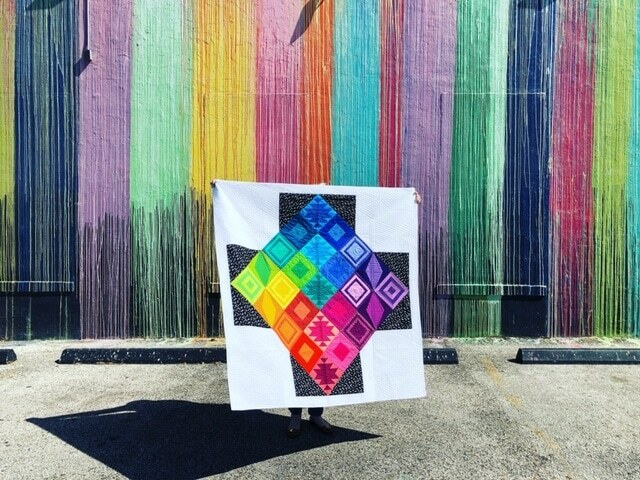 For my throw quilt, I made 8 Flying Geese blocks – 2 in each color. Now it’s time to assemble the quilt top. Lay out your Giant Flying Geese blocks. 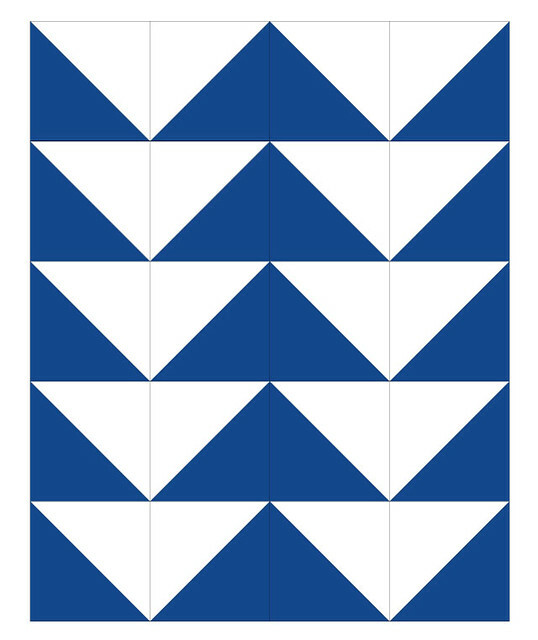 You can assemble the quilt top as shown below by sewing the geese together in horizontal rows (press seams in alternating directions). Or you can choose to sew them together in columns (press seams up in the right column and press seams down in the left column). Once the top is pieced, press seams open or to the side. 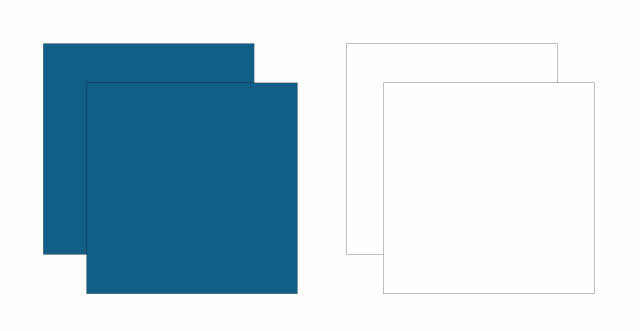 Here’s a quick look at the digital mockups of the other sizes in 2 colors. For the baby quilt, I show how you could add 2 1/2” strips to make the quilt a little wider. You could also do this with the other sizes to beef them up. And here’s the possible Queen/King version. It’s kind of small to be a Queen or King, so you may want to add strips to this size. Ok, there’ my Big Geese Tutorial. Have fun and let me know if you have any questions! 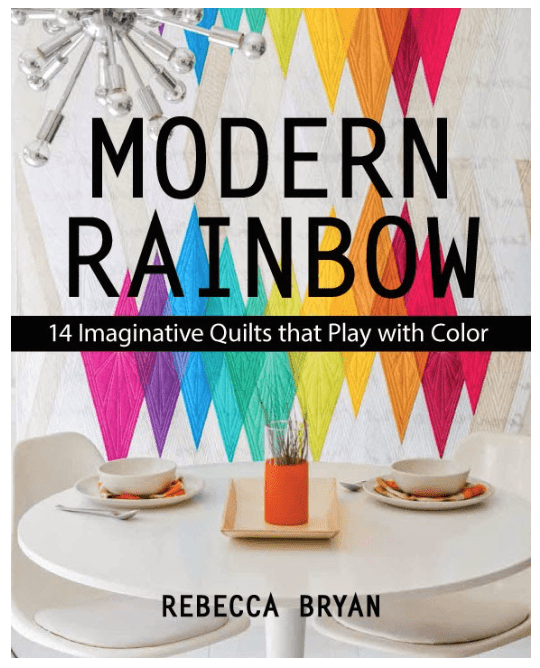 I do NOT need another project on my "to sew" list but I love this so much I just might need to bust one out (after Quiltcon ;-). Thanks for sharing! Looks great and a versatile pattern. Could you please give a tutorial on how you pieced it together.